See the app preview video in the App Store. What is that person's name? Have you ever seen someone and recognized the person but can’t remember his or her name. This happens to everyone. 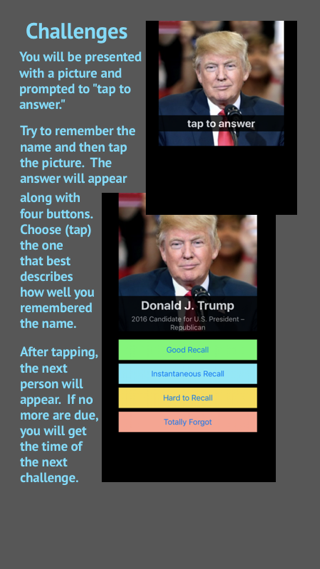 Now you can improve your name recall ability by using FaceCards. All you need is a picture of that person. 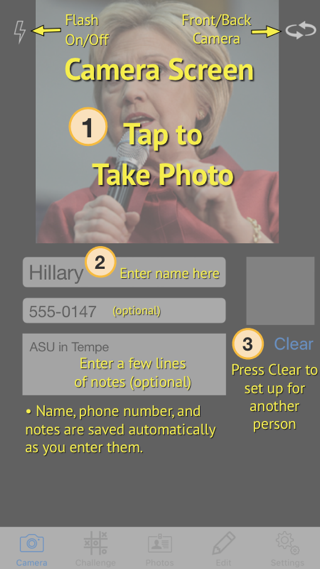 With this app you take their picture, enter their name, and then you will be challenged – or quizzed – periodically. 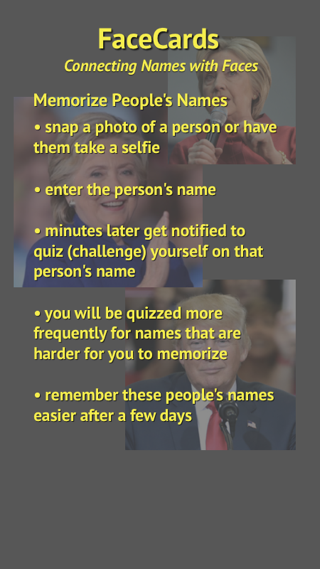 This will help make it easier to remember people’s names. Try it out! Challenges are spaced out at intervals according to how well you remember the person’s name. The challenge screen will present you with a picture and ask you to recall that person’s name. The better you remember the name, the less frequently you will be quizzed on him or her. 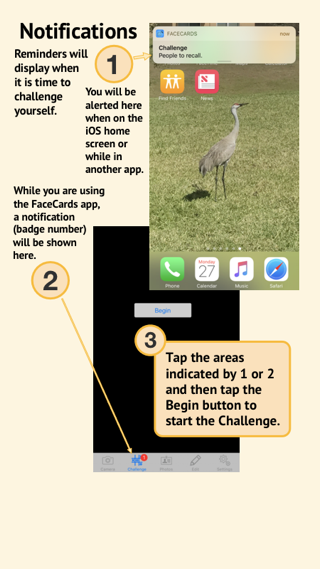 If you indicate to the app that you are having trouble remembering the name, the challenge notification for that person will appear more frequently. For people you are having trouble remembering, the interval will be from five minutes to one hour. If you are good at recalling the name, the interval will increase quickly to one day and then many days the better you get at remembering that person’s name. 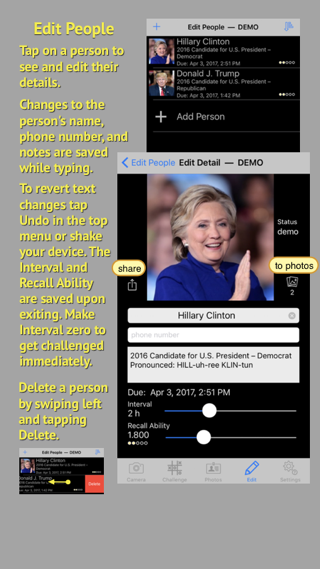 You should be able to remember many, many names using this technique! On the Edit screen for a person, tap the Share button to save to your address book, or to send the person to someone else via a text message or an email. The name, ‘featured’ photo, phone number, and notes will be shared. The Demo mode supports up to 10 people. An in-app purchase allows Unlimited People. Suggestions, requests, bug reports can be sent using the Contact the Developers page. This app was written initially in Swift 3.1 using Xcode 8.3 on MacOS 12.4. The Swift Programming Language — an open source product by Apple Inc.
SQLite SQLite is a self-contained, high-reliability, embedded, full-featured, public-domain, SQL database engine. SQLite is the most used database engine in the world. FMDB A Cocoa / Objective-C wrapper around SQLite. I highly recommend this series of class lectures by Brad Larson. He is a fantastic teacher and I can virtually guarantee that if you are a beginner or an intermediate iOS programmer you will learn a lot from this class (even though it is a few years old). You will also see him contributing in the online community, such as stackoverflow.com. Tutorials on RayWenderlich.com — Outstanding free tutorials. stackoverflow.com — Essential site with answers to all kinds of questions and issues that developers face.